News Photo by James Andersen Alpena’s Aidan Goike (11) drives in for a layup past Gaylord defender Cordell Larose during the first half of a boys basketball game on Thursday at Alpena High School. Alpena boys basketball coach John Pintar’s message to his team was simple on Thursday. After more than week since their last game, the Wildcats took that message to heart and responded the way Pintar hoped. Chris DeRocher scored 26 points, Bruz Copping added 25 and the Wildcats ran past Gaylord with a fourth-quarter surge to defeat the Blue Devils 70-55 at Alpena High School. Since beating Sault Ste. Marie at home last Tuesday, Alpena (11-2, 4-2 Big North Conference) has been kept from the gym due to heavy snowfall and blistering cold. 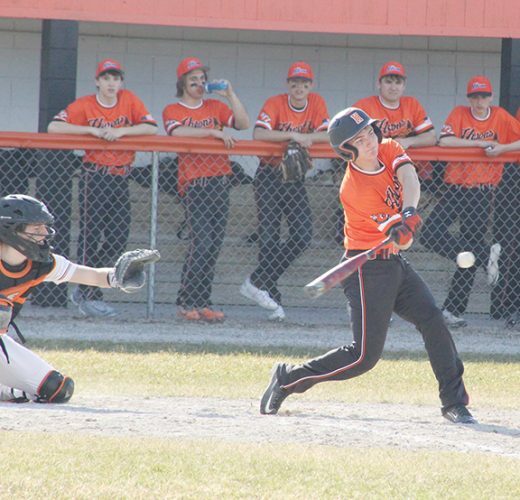 If it affected Alpena on Thursday, the Wildcats didn’t show many signs of fatigue. They attacked Gaylord from all over the floor offensively, made defensive adjustments to keep the Blue Devils on their heels in the second half and ultimately gained an important win to stay in the Big North Conference race. Copping drove the lane to score with 2:06 left in the third quarter to give Alpena a 44-42 lead after 24 minutes and tip the game in Alpena’s favor for good. He added a pair of free throws early in the fourth quarter and DeRocher drilled a three-pointer to push Alpena’s lead to seven. Despite an attempt to play an up-tempo style of offense, the Blue Devils never got closer than four after that. In the final quarter, Alpena outscored Gaylord 26-13 and limited Gaylord to just one three-pointer. The increased defensive effort was an encouraging sign for Pintar after he made adjustments at halftime to better defend the perimeter. 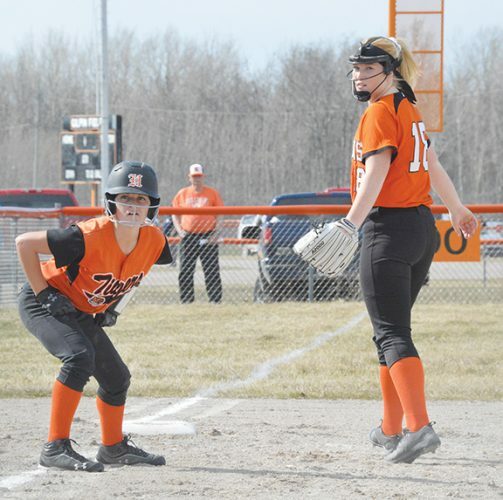 Gaylord made eight triples for the game, but made just two of them in the second half. Alpena made sure to crowd Gaylord’s shooters and attempts to push the ball inside resulted in some costly turnovers for the Blue Devils down the stretch. Gaylord’s last three-pointer came from Kyler McKenzie with 6:04 left to play and made it 49-45. But Alpena showed its prowess from outside and sank four treys in the fourth quarter, including three from DeRocher. Strong outside shooting allowed Alpena to match Gaylord nearly point for point in the second quarter. Gaylord hit five triples in the period, but Alpena made four of them and ultimately held a 35-32 lead at halftime after a 10-3 run in the final two minutes of the half. Jared Landrie led Gaylord with 16 points and McKenzie had 10. Senior forward Blake Charboneau gave Gaylord a boost in the second half, scoring eight points, but the Blue Devils inability to score in bunches late hurt their chances to win. 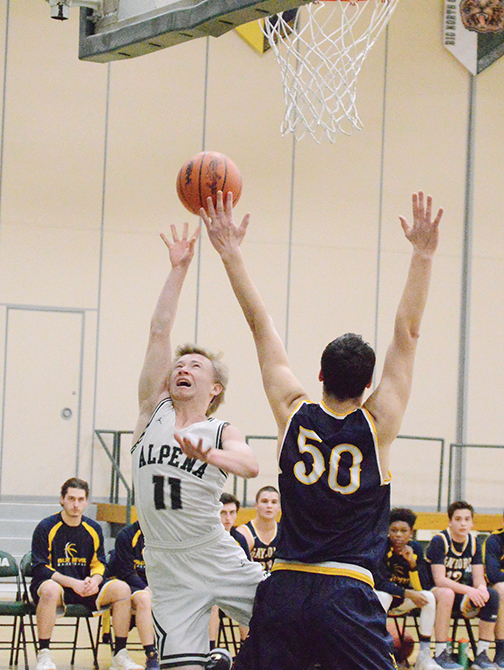 A driving layup from Copping gave Alpena an early five-point lead in the third quarter, but Gaylord continued to push the Wildcats eventually tied the game 42-42 on another three-pointer. Copping’s bucket in the lane gave the Wildcats the lead back and Alpena led the rest of the way. Alpena will be back in action on Saturday and will play Dearborn Heights Crestwood at 11 a.m. at Little Caesars Arena in Detroit. The Wildcats have played in the Metro Detroit area several times in recent years, but this will be their first experience in the new home of the Detroit Pistons and Detroit Red Wings. “You always look for experiences for the guys where they can leave and say they did certain things, so I’m really excited that they get an opportunity to go down and play at a beautiful new arena,” Pintar said. Alpena’s JV team defeated Gaylord 69-16. Keegan Hahn had 17 points for Alpena, Cooper Bright had 16, Ryan Voltz had 12 and Lucas Manning scored 10. Alpena’s freshman team defeated Gaylord 57-12. Austin Prue led Alpena with 16 points, Everett Zann added nine and Travis Weide chipped in with seven. ALPENA (70): J. Duncan 2 0-2 4; B. Copping 8 7-9 25; C. DeRocher 10 2-6 26; Co. Donajkowski 1 1-2 3; H. Goebel 1 0-0 2; K. Stark 2 0-0 5; A. Goike 2 0-0 5. 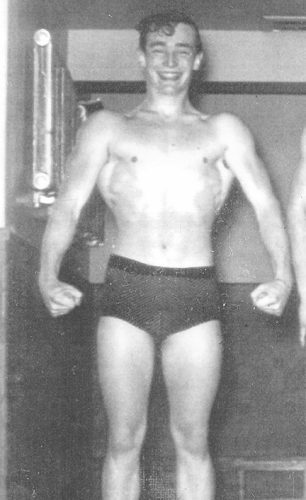 GAYLORD (55): J. Landrie 6 1-1 16; C. Deer 1 0-0 2; C. Gahm 2 0-0 4; C. Larose 2 2-2 6; R. Gapinski 2 1-2 7; K. McKenzie 3 1-2 10; J. Miller 1 0-0 2; B. Charboneau 4 0-0 8.